We planned for a hiking trip to Nepal and decided to add on climbing of Island Peak, We were recommended by satisfied customer to contact Mr Suman at Asian Hiking team. He arranged the climbing as part of our hiking from Jiri to Everest base camp. When we arrived to Kathmandu and had problem with damaged luggage, he helped us. 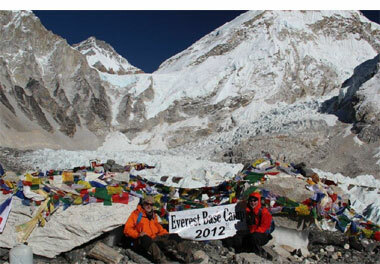 We also booked a guide for our trekking from Jiri to Everest Base Camp. The guide that was our companion for 30 days (except Island Peak there we had a climbing guide)) was Lachhu Rai, a nice and experienced guy. During our trekking Mr Suman was in contact and supported us in all way that was needed, and there was some help needed, everything to give us a pleasant journey thru Nepal. 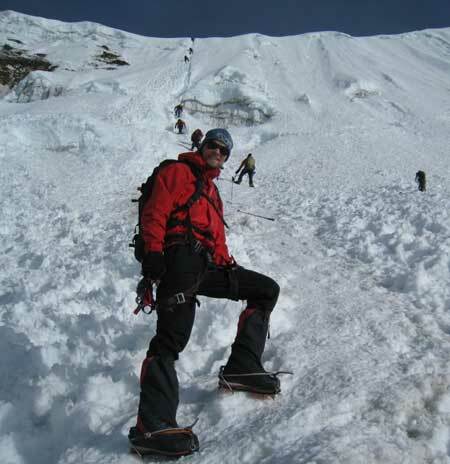 We recommend anyone that should visit Nepal to contact Mr Suman at Asian Hiking team to get a nice and joyful hiking. Ingvar Henriksson and Jan Bäckström from Sweden. I'm so very sorry for the delay in sending this email. We have arrived home from Nepal already two month ago. Let me just tell you how very much me and my friend enjoyed the trip with Asian Hiking Team. The panorama we saw was breathtaking, and in spite of the tiredness we sometimes felt the whole trips made it easy and enjoyable for us. Our porters, unwanted to say, were amazing, and, above all, our guides, Suman was especially helpful. Whenever we go back to Nepal we hope to be able to go on a trek with Suman. I especially hope to see Suman in the position as a team leader next time, he would have earned it! I really enjoyed learning about the Nepalese culture and other things from him; it was great to have someone around that could express these things so as that we could understand them. All in all, I felt very well taken care of and motivated throughout the whole trek in Ghorepani Ghandruk Circuit! Next time I think we could do higher elevation. Take Care, and let's keep talking! Wilderness Solutions had a fantastic Island Peak climb with you this October. It really was superior and I cannot thank you all enough for the quality of service that we received throughout the planning and Climbing. I am so glad that we worked together again and again. We were sanctified by some quite wonderful weather conditions that enabled us to see the very best of the Chhukum Valley. The accommodation in Kathmandu was very good and the choice of tea houses/lodge on the trek was also good. We would not hesitate in recommending your company to others interested in travelers to Nepal. At last but not least, Thank you Chhettan for your amazing support and patience in the Island Peak. It was great climbing in Nepal 2013 and support of a real Team. Even though I fixed plan in at the last moment, I initiated everything. Not only did this climbing give me a view from the summit of Mera peak but the self-confidence, intellect and the inspiration to plan and perform my next climbs. The accommodation in Kathmandu was very good and the choice of tea houses on the trek was also good. We slept two nights in Camp otherwise its possible tea house. Our guide Chhettan did a brilliant job. All porters and supporter gave enough help. Climbing was not tropical difficult but it was our first time in Nepal and having above 6000 meters so we both feel hard. After return from Mera peak in Kathmandu we got problems of chest "chest infection". Now we already ok here in USA and want again to go Nepal. We would just like to say that we really enjoyed our holiday with your company in Nepal. I'll be recommending Asian Hiking Team to my colleagues, family and friends as well.